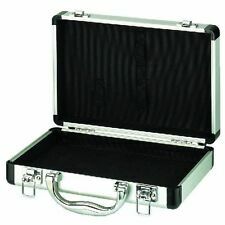 A small thin flight case. Cases and Enclosures are suppliers of quality flight cases, hurricane cases and plastic enclosures for a wide range of uses and applications. Established in the UK in 2003. Inside dim. (WxHxD) 242x55x159 mm. Universal mini case, with aluminium sides. Colour silver. Universal case. Elasticated holders on inner side of the cover. If we go wrong at any point, we would like the opportunity to rectify. 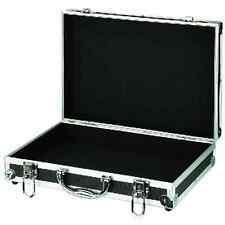 Aluminium Flight Case (280x225x65mm). A small thin flight case. Cases and Enclosures are suppliers of quality flight cases, hurricane cases and plastic enclosures for a wide range of uses and applications. Inside dim. (WxHxD) 365x80x245 mm. Colour black. Universal case. If we go wrong at any point, we would like the opportunity to rectify. Purpose/capacity universal. Outside dim. (WxHxD) 380x102x280 mm. Case Colour Black, Silver. Carrying Case Material Plywood. During that process you will be issued with an RMA number. Images shown are for demonstration purposes. Protection for valuable equipment The mantona Outdoor ?Protective Case was developed for toughest outdoor use. It offers highest protection for your valuable photo equipment, which you want to transport safely on your shoots. It is also very well-suited for transporting smaller, sensitive items, such as jewelry, technical equipment or valuable documents. In order to ensure a space-saving transport, you can stack the Outdoor Protective Cases on top of each other. Foam inserts for individual adjustment The foam inserts on the inside of the case enclose the content carefully and at the same time cushion impacts. In order to use the space in the case even more efficiently, you can simply remove the foam inserts. The mantona Outdoor ´Protective Case was developed for toughest outdoor use. In order to ensure a space-saving transport, you can stack the Outdoor Protective Cases on top of each other. The convenient hand valve allows a manual pressure equalization in the case, e.g. after a flight.